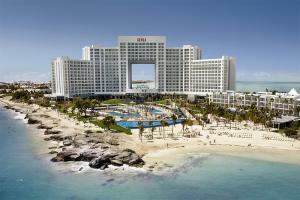 Set at the tip of a peninsula, this Riu resort features stunning ocean views and sparkling beaches surrounding it on three sides. The sprawling waterscape offers four spectacular pools, and the refreshing shade of tropical palm trees invites relaxation. Tempt yourself with the pampering treatments of the spa and the culinary creations of the resort's chefs. All meals and snacks - Breakfast: Full American breakfast buffet, on the spot cooking stations, fruits, juices and Cava. Lunch: Hot and cold buffet and on the spot cooking stations. Dinner (main restaurant): Buffets and on the spot cooking stations.